File Types: PSD; File Size: 43.56 MB; Requirements: Adobe CS4+; Layered: Yes; Dimensions: 1500 x 1500 px. 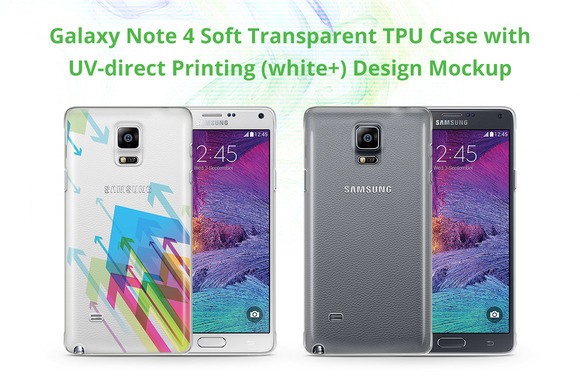 Layered PSD file to make a mock-up of " Galaxy Note 4 " Soft TPU case with any design or color by simply editing the Smart Layer. Specialised designed template for UV direct printed case design. - In case you need different camera cut, angle, material, other model or automation in Photoshop for multiple mockup generation process do contact us, we'll happy to help ? Note: Images used in the preview are not included in the package. Keywords: samsung, galaxy note 4, samsung galaxy note 4, note4, uv printed case, direct printing, white color print, psd, template, tpu, soft plastic, presentation, phone cover demo, editable psd, cover mockup, printed, custom designed cover, digital print, printed mobile cover..
Best ddsign template, vectors, illustrations, video templates from creative professional designers with After Effect, PhotoShop, 3DS Max, Cinema 4D or InDesign. Full details of CreativeMarket Galaxy Note 4 TPU Case UV Print Mock 494543 for digital design and education. CreativeMarket Galaxy Note 4 TPU Case UV Print Mock 494543 desigen style information or anything related.